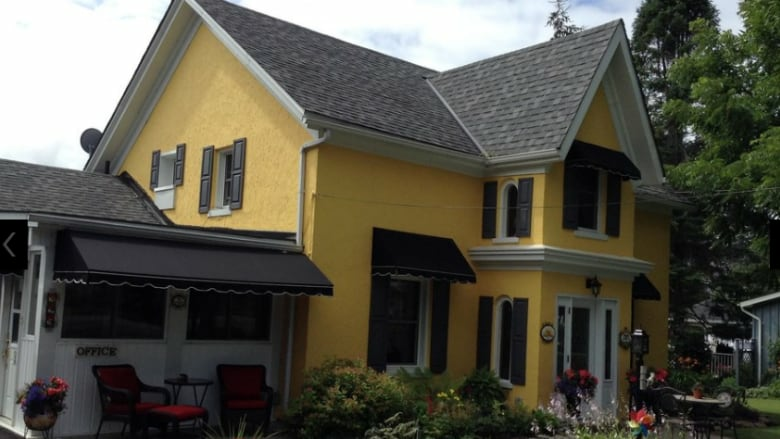 A Toronto couple were shocked when they were forced to leave a Prince Edward County bed and breakfast that wouldn’t accept their service dog. A Toronto couple were shocked when they were forced to leave a Prince Edward County bed and breakfast that wouldn't accept their service dog. David Greenwood is visually-impaired and relies on Romy, his black Labrador, to get him around. "She's basically my eyes," he told CBC Toronto. Should Ontario crack down on those who use fake service dogs? But when Greenwood and his wife, Jill, arrived at Sunrise Bed and Breakfast in Bloomfield, Ont., this summer, they were told its no-pet policy extends to service animals — even though they showed the owners all of the proper paperwork. "We were set aback," said Greenwood. "We mentioned that service animals are allowed in all public places, and they said this isn't a public space, this is their home," he said. John Stenning, who runs the Sunrise along with his wife, Joan, is also upset about what transpired, although he stands by his decision. Stenning says he wishes the couple had told him they were bringing a service dog (Greenwood says he can't remember if he did,or not), so he could have told them months in advance and helped find them another place. Stenning says he didn't want to house the dog because he was worried it would leave allergens that would bother future guests of his two-room facility, noting he often hosts people with breathing issues. The ordeal has left both Greenwood and Stenning wondering what the rules are in a situation like this. The Accessibility Directorate of Ontario said in an emailed statement that if a bed and breakfast has at least one employee, it must adhere to the Accessibility for Ontarians with Disabilities Act (AODA), which states people with disabilities must be able to bring service animals with them in areas open to the public. Prominent accessibility lawyer David Lepofsky, who chairs the AODA Alliance, says refusing someone with a service animal also violates Ontario's Human Rights Code, which guarantees everyone equal treatment with respect to services and facilities. "Renting a hotel or a B&B room would seem to me to be pretty obviously a service or facility," he said. Stenning has hired his own lawyer, Anthony Peter Girard. On TripAdvisor, where several online posters lashed out at Stenning for refusing a service dog, Girard wrote a post accusing them of making libelous comments. The lawyer also suggests bed and breakfasts are private homes that have "limited accomodations for the public" and don't have to adhere to Bill 80 of the Ontario Service Dogs Act 2016 — a piece of legislation that hasn't cleared Queen's Park. Kitchener-Conestoga PC MPP Michael Harris is behind the bill. His executive assistant, Rob Willett, says the legislation is intended to get service animals into more places, not fewer, and suggested the language could be changed to specifically include places like bed and breakfasts. Doug Frost, president of the Federation of Ontario Bed & Breakfast Accomodation, says his organization has never obtained a legal opinion about whether or not B&B operators must be prepared to welcome service animals. "If someone requires a service dog, our general policy is the service dog should be allowed into the house," he said. In cases where the host can't do that, they're urged to help find another option. Frost, noting many bed and breakfasts are run from family homes, suggests guests should let the host know that they're bringing a service dog in advance and provide relevant documentation. Greenwood and his wife wound up staying at a hotel in Trenton, Ont., more than 40 kilometres away from where they wanted to be. He says he's not planning on launching any legal action as a result of what happened, but he hopes it will educate some other bed and breakfast owners. "I hope that people are cognizant of the law," he said. He also wants the government to make the rules clear. Meanwhile, Lepofsky, accessibility advocate, says it's time the province starts cracking down on those violating the AODA. "The frustrating thing is this: people who use a guide dog or a service animal continue to face exclusion and discrimination all over the place," he said. "In the year 2017, it's ridiculous."